This winter, my Pre-K French class has been working on a unit centered on the classic children’s musical composition, “Peter and the Wolf, by Sergei Prokofiev. “Peter and the Wolf” is a unique and memorable work because it tells a story through music, where each character is represented by a different instrument or instruments. For example, throughout the story, Peter is represented by the string instruments, his grandfather by the bassoon, and the wolf by French horns. By listening to “Peter and the Wolf” and reading the storybook, students were able to use their imaginations and understand how the story was told through music. 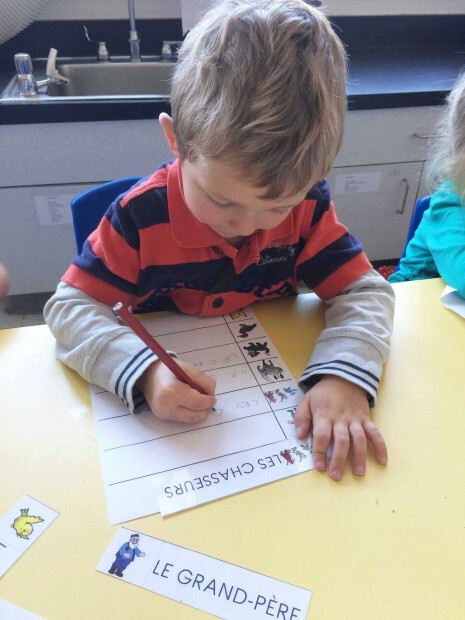 We also used the work as a jumping off point to expand our knowledge of music and musical instruments, and to work on pre-reading and writing. Finally, for the biggest and most exciting part of the part of the project, we created an interactive storybook mural in the hallway for all the students in the school to enjoy. Earlier this year, our class learned about musical instruments, but “Peter and the Wolf” gave us so many more instruments to discover! I introduced students to each of the instruments in “Peter and the Wolf,” and we talked about what each instrument looks like, what sound each makes, and how each is played. 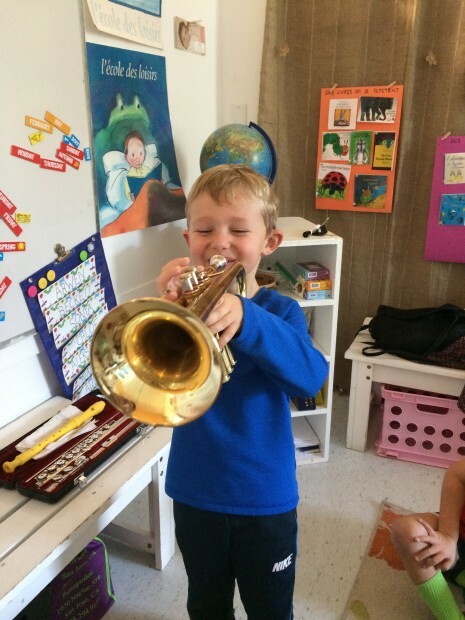 We watched videos of professional musicians playing their instruments, and some parents shared videos of students’ older siblings playing their own instruments. 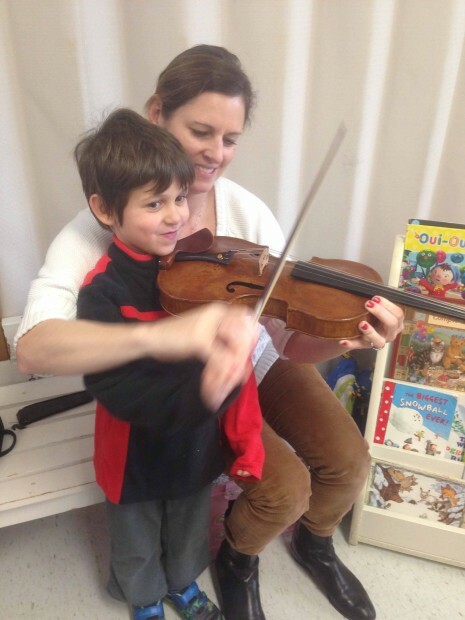 One mom even came to play violin in front of the class, and my husband came in to play the bass, guitar, and ukulele. The children brought in instruments they had at home, and we practiced playing them together. We also made posters to sort all the instruments into different families – string, wind, and percussion. To work on our pre-reading and writing, students presented the book to parents by writing the names of each character in our “cahier de vie.” We also wrote out the title by gluing letters in the correct order. 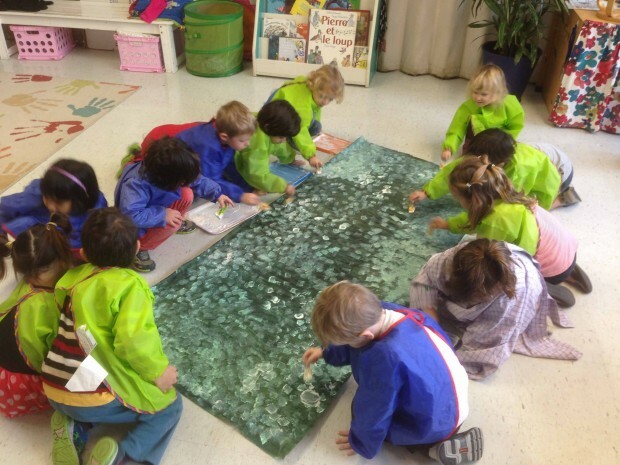 We decided to share the story of “Peter and the Wolf” with the whole school by making a huge mural of a page from the book for the school hallway. To do this, we worked with many different techniques, painting with brushes, rollers, forks, and sponges, and using tempera paint and ink. We drew, cut out, and glued the different elements of the setting and we colored in each of the characters. I created a QR code for each character, which when scanned would link to the sound of that character’s instrument. As a class, we listened to each link, and put the correct QR code on each character. 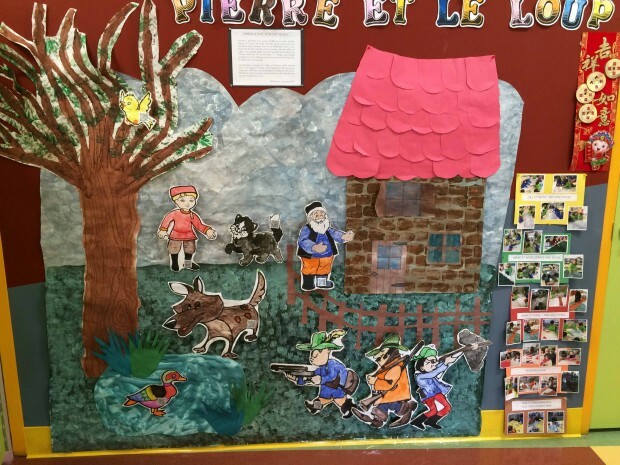 My students were very excited and engaged by the “Peter and the Wolf” project, and they were especially proud to share their work with the entire school. The project encompassed many different domains – pre-reading, writing, music, and art, and all the activities were linked together. Students enjoyed being part of a long, multifaceted project because every day they knew they were working on one more piece of the whole, and they came to school with excitement and joy, knowing they were in the process of building something huge.